One's immediate reaction before hearing a note is the generosity of the coupling on this 2CD issue. Mozart's last three great symphonies, his Requiem and Brendel too. It looks like splendid value - and it turns out to be just that. The recordings that DG chose for the Symphonies are from the Karl Böhm / Berlin Philharmonic set that was issued in the early 1960s. Big orchestras were the norm then for performances of the classical composers and there was little of today's slimline and often quicker Mozart. Looked at from today's perspective once the mind has made the compensating jump needed the music takes over and within reason size ceases to matter. The E Flat (No 39) is a delight. The strings avoid sounding overheavy, the quiet opening to the Andante almost like a chamber orchestra, the woodwinds are splendid in the trio and the finale scampers along in irresistible fashion. No 40 - the G Minor that in butchered form became a pop chart entry some years ago - has a steady rather than exuberant opening, a second movement Andante with some exquisitely shaded sectional string playing, a rather stolid minuet and trio and a restrained Finale. 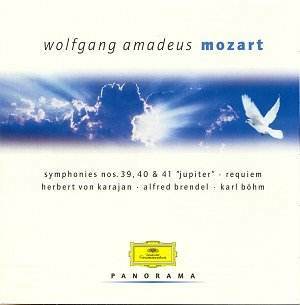 Of the three eminently sound performances, Böhm's Jupiter is the pick. Tempi throughout seem just about right, the strings have space to show the Berliners' qualities, the magnificent winds play impeccably and the recording clarity allows them to be heard as they should be. A straightforward, affectionate performance full of warmth. Alfred Brendel's K457 the Sonata No 14 in C Minor is the only fully digital item (1985) in the double pack. Many people will recognise Brendel as a Philips performer and the recording is credited to them in the booklet. His playing of this rather sombre piece is, as ever, highly individualistic. This is a strong, powerful version which avoids over-sentimentalising the well-known middle adagio and drives quite fiercely at times in the two outer movements. Listeners be warned that the sometimes annoying noises you may hear are Brendel himself in his supporting vocal role. The recording is excellent. The Requiem is given a dramatic, highly colourful reading by Karajan. Everything is on the big scale, rich and colourful and every effect he can find is there. The feeling of effect triumphing over subtlety comes across but the result is undoubtedly striking. Individually and as a team the soloists impress (Walter Berry is outstanding) and the Viennese Chorus is quite magnificent and in many ways they steal the show. Inevitably the Berlin Philharmonic is impeccable and the entire recording will please those who enjoy their Mozart in technicolour and wide-screen. The recording is a good one (from 1962) but its wide range brings out some hiss.